Pumpkin and carrot soup is everywhere. Just like pumpkins themselves at this time of year, you can’t turn without seeing one. They’re virtually throwing themselves at you. And you know what? They’re mostly ignored too. 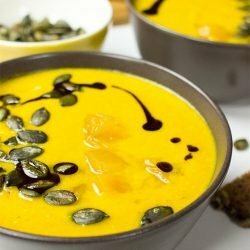 There are so many pumpkin and carrot soup recipes around, that to stand out, they’ve got to be something special. And this one is. Oh yes. 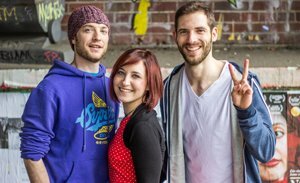 If you know this blog, then you’ll know we like our food quick. But when we say quick, we mean with speed and not haste. A good soup should never be rushed, merely encouraged. If we rush too much, we’ll sacrifice flavour. And we don’t want that. Oh no. In fact, that’s really the opposite of what we want. So, for good measure, we’re going to add extra flavour too. You know what pairs really well with pumpkin and carrot? Apple. Yep, it’s awesome. That little surprise burst of sweetness is just what this dish needs, and I’d never make it without apple again. And you know what pears (sorry) really well with sweet apple? Pickled pumpkin. That sharp bite with a tang of vinegar in the middle of your soup is just fantastic. Once you’ve tried it, there’s no going back. 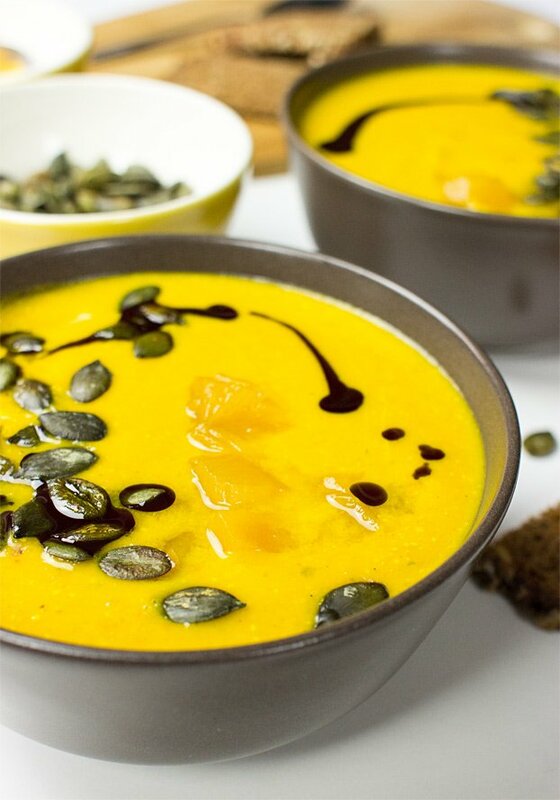 Pumpkin and carrot soup – or should that be squash? In many recipes pumpkins and squashes can be used interchangeably. In fact, pumpkins are really members of the squash family – and you can use any you like. We recommend trying several types as the flavours always vary a little, then settle on your favourite. We usually use the hokkaido pumpkin (a small relative of the traditional big orange one you see at Halloween), or a butternut squash. This page shows various varieties of pumpkins – see which flavour suits you. It can also be a great idea to buy whatever is on offer. Huge batches of pumpkins and squashes often get harvested at the same time, and if stores are overloaded then the price comes down for a quick sale. Over the autumn/fall period it’s not uncommon to see a different variety of squash on sale every week! Another great question. Many pumpkins and squashes have an edible outside – so peeling is really up to you. You’ll save time if you don’t peel, and for a soup, the skin will get blended anyway. This list also says whether the skins are edible or not. If you do decide to cook the pumpkin with the skin on, make sure you give it a good scrub first! 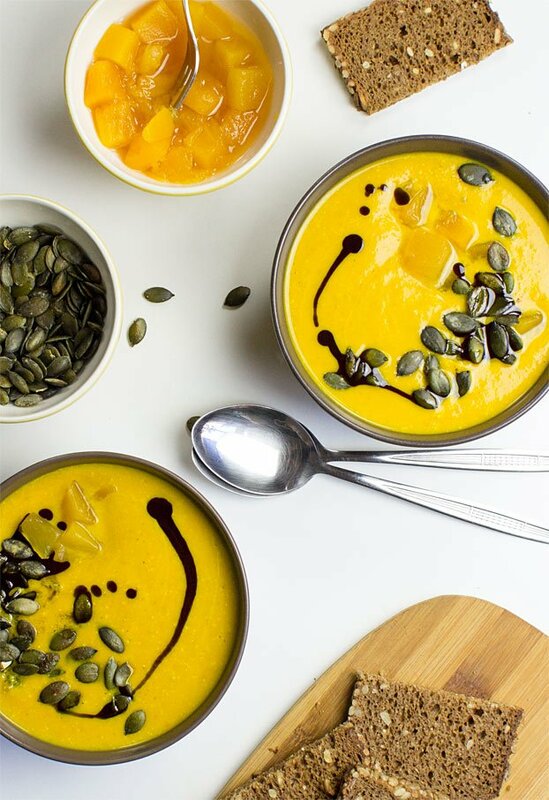 So, choose a pumpkin or squash, grab your carrots, apple and jar of pickled pumpkin and you’ll have a restaurant-level pumpkin and carrot soup ready and waiting in no time. 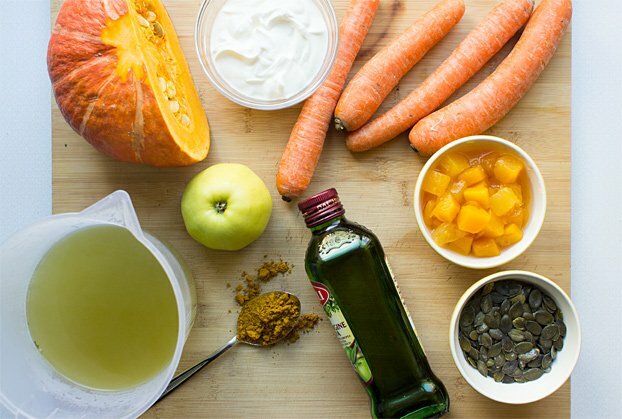 Take your soups to the next level with this quick but quality pumpkin and carrot soup recipe. 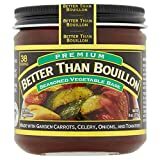 No more run of the mill soup for you! Chop the pumpkin and carrots into rough cubes. Add the oil to a large pot and put on medium heat. Add the chopped veg and fry gently for five minutes, stirring occasionally. 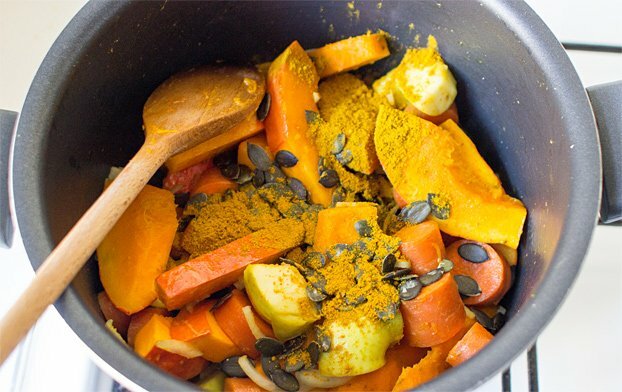 Add the pumpkin seeds, curry powder, apple and ¼ cup water and fry for another 2 minutes. Add the stock and let it all simmer for 10 minutes. Finally, add the cream and give it a good stir. 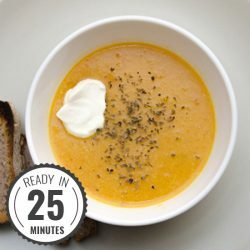 Use a masher or hand blender to give the soup a quick pulse. To finish the soup off add a pinch of salt and pepper and lemon juice. Have a test and see if it needs a little more salt or lemon. Done! 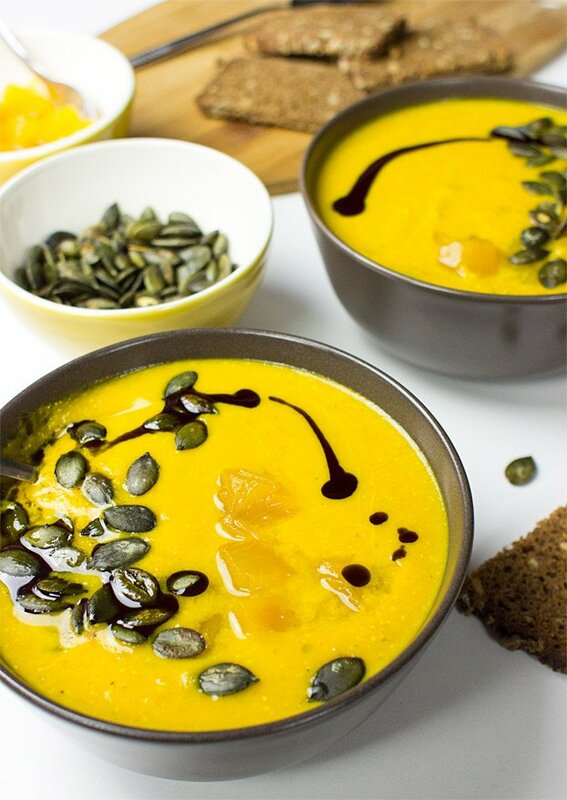 As you serve the soup, add some pickled pumpkin pieces, (roasted pumpkin seeds) and pumpkin oil to each bowl. Gotta love a good soup! We also have a sped up, but still delicious, red onion soup over here. Yummy. 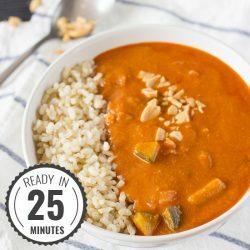 If you’re looking for something more ‘main meal’, then this African peanut soup is top of the league! 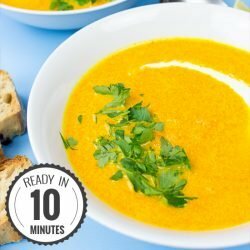 Carrot and Ginger Soup - souper fast!